A large petrified log, partially exposed for about 1 meter, was found by a villager in a reserve forest at Ban Tak District, Tak Province, in October 2003. The discovery of the petrified wood was reported to the National Park, Wildlife and Plant Conservation Department, under the administration of the Ministry of Natural Resources and Environment. The officer from the department subsequently came to examine the petrified log and survey the surrounding area. The petrified log was further excavated and was found to be about 4 m and 1.8 m wide at the base and the middle, respectively. The trunk was exposed to a length of 21 m without reaching the upper end (Boonchai et al. 2009). It was later found, after other tests were conducted and the trunk was completely excavated, that it was 72.2 m in length! On the eastern terrace of the modern Ping River, a well-rounded gravel deposit with numerous silicified wood stumps overlying a sand layer is present. These gravel, petrified wood, and sand deposits are regarded as a channel deposit from the ancient Ping and Wang rivers. The sand and wood had been silicified forming a sandstone bed that incorporates the silicified tree trunks. Associated gravel deposits have also been partially silicified into conglomerate, especially along the sand/gravel boundary. No exact age of the gravel, sand, and fossil wood deposits has been determined. However, the geology of northern Thailand region, shows ancient river sediments and gravel deposits generally occurs river terraces more or less parallel to the modern rivers. 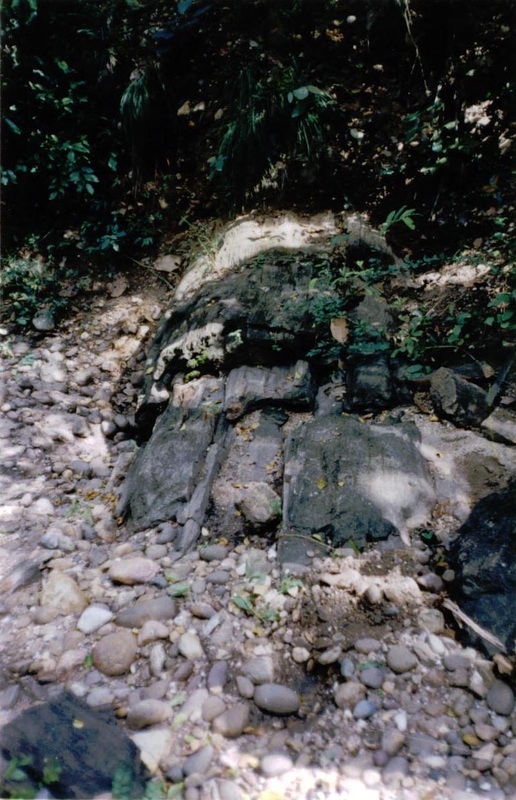 A gravel deposit in Mae Tha, Lampang province, upstream of the Bantak Petrified Forest Park along the Wang River, is overlain by a basalt flow 600,000 – 800,000 years in age. Therefore, as these gravel deposits must be older than the age of the basalt flows, they must be more than 800,000 years old, or Early Pleistocene in age. A similar age has been inferred as an age of the gravel and fossil wood deposits in the Bantak region. The fossil site is located in the eastern portion the “Ban Tak-Sam Ngao basin”. The sedimentary basin covers an area about 435 km2, about 16 km wide east-west and about 27 km long north-south. It includes some areas of Ban Tak and Sam Ngao districts of the Tak province and is surrounded by chains of lower hills to high mountain ranges. This region is structurally regarded as a granite pluton-based basin.